The Viking Age was a period of considerable religious change in Scandinavia. Part of the popular image of the Vikings is that they were all pagans, with a hatred of the Christian Church, but this view is very misleading. It is true that almost the entire population of Scandinavia was pagan at the beginning of the Viking Age, but the Vikings had many gods, and it was no problem for them to accept the Christian god alongside their own. Most scholars today believe that Viking attacks on Christian churches had nothing to do with religion, but more to do with the fact that monasteries were typically both wealthy and poorly defended, making them an easy target for plunder. The Vikings came into contact with Christianity through their raids, and when they settled in lands with a Christian population, they adopted Christianity quite quickly. This was true in Normandy, Ireland, and throughout the British Isles. Although contemporary accounts say little about this, we can see it in the archaeological evidence. Pagans buried their dead with grave goods, but Christians normally didn't, and this makes it relatively easy to spot the change in religion. We know almost nothing about pagan religious practices in the Viking Age. There is little contemporary evidence, and although there are occasional references to paganism in the Viking sagas - mostly composed in Iceland in the 13th century - we have to remember that these were written down 200 years after the conversion to Christianity. We know that chieftains also had some sort of role as priests, and that pagan worship involved the sacrifice of horses, but not much more. We know rather more about the stories associated with the pagan gods. Besides occasional references in early poems, these stories survived after conversion because it was possible to regard them simply as myths, rather than as the expression of religious beliefs. The main sources of evidence are the Eddas, wonderful literary works which represent the old pagan beliefs as folk tales. Even here there is some Christian influence. For example, the chief god Odin was sacrificed to himself by being hanged on a tree and pierced in the side with a spear, and this was followed by a sort of resurrection a few days later - a clear parallel with Christ's crucifixion. Even so, the Eddas provide a huge amount of information about the ®sir (gods), and their relationship with giants, men and dwarfs. 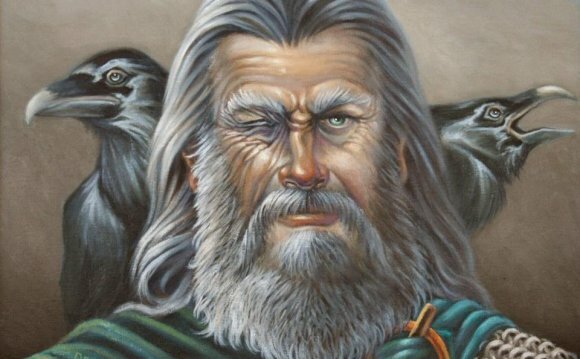 The most powerful god was the one-eyed Odin, the Allfather, god of warfare, justice, death, wisdom and poetry. Probably the most popular god, however, was Thor, who was stupid but incredibly strong. With his hammer Miollnir, crafted by the dwarfs, he was the main defender of the gods against the giants. He was also the god of thunder, and he was particularly worshipped by seafarers. Amulets of Thor's hammer were popular throughout the Viking world. The brother and sister Frey and Freyja, the god and goddess of fertility, were also important, and there were many other minor gods and goddesses. The great enemies of the gods were the giants, and there were often conflicts between the two races. Among the gods, only Thor was a match for the giants in strength, so the gods usually had to rely on cunning to outwit the giants. Odin himself was capable of clever tricks, but whenever the gods needed a really cunning plan, they turned to the fire-god Loki. Like fire, which can bring necessary warmth or cause great destruction, Loki did many things that benefited the gods, but he also caused them great harm, and often the problems he solved had been caused by his mischief in the first place.